In a large bowl, stir together yeast, 1 tablespoon of flour, and ¼ cup of warm water. Let sit for 5 minutes or until mixture looks foamy. Stir in the remaining water and salt. Add flour, ½ cup at a time, until dough pulls away from side of bowl. Knead dough on light floured surface until it becomes a soft, smooth, and elastic ball of dough. Loosely cover bowl with a cloth and let rise in a warm place until doubled in size, about an hour. After the dough has doubled, place 2 Tb olive oil in a 10 inch or 10½ inch cast iron pan and lightly press the dough down into the oil and spread it to the sides of pan. Cover with a cloth and let sit in a warm area for 2 hours. In a small food processor, combine all sauce ingredients and puree until smooth, about 30 seconds. Set aside. In a small skillet, over medium-high heat, add the olive oil with the sliced mushrooms and saute until lightly browned, about 2-3 minutes. Turn heat to high and add sherry and salt. Cook until all of the sherry evaporates, about 1-2 minutes. Set aside. Lightly press down on the dough in the pan to release any air bubbles that may have formed while rising and to push dough to edge of the pan. Spread the sauce over top of dough to the edge of the pan. Top with the Mozzarella cheese, the sherry mushrooms, chorizo, green olives, and Manchego cheese. Bake for 15 minutes, or until bottom of crust is a golden brown and the cheese is fully melted and lightly brown. Remove pizza to a cutting board and cut into 6-8 slices. 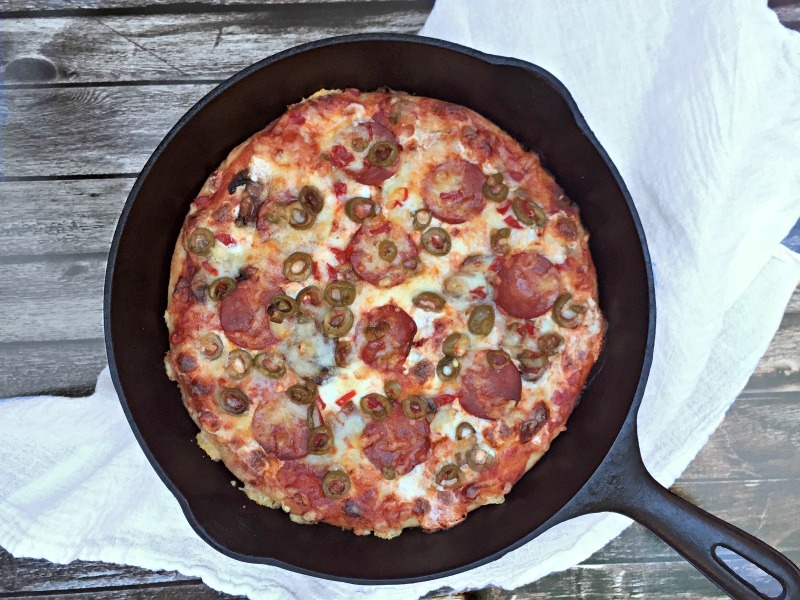 The flavors of sunny Spain in a deliciously cheesy Spanish Pan Pizza. Homemade pizza dough and sauce recipes are included!